Upon assuming his role as the Director of Maintenance and Operations for Estes Park School District R3, Dave Coleson identified a number of elements in the District’s overall security program that he felt needed to be improved. Along with the need for structural reinforcements to the main entrances of some of the school buildings and the addition of a campus-wide CCTV system, Coleson determined that the existing key system would need to be replaced. Over time, the inability to track or limit the distribution of keys had created a situation where the administrative team at Estes Schools could no longer be confident in their ability to secure access to the campus. After evaluating replacement key system options, the Estes Park School District selected a proprietary mechanical solution from InstaKey Security Systems of Lakewood, CO in June of 2013. Campus-wide conversion to InstaKey was completed in July of 2013. 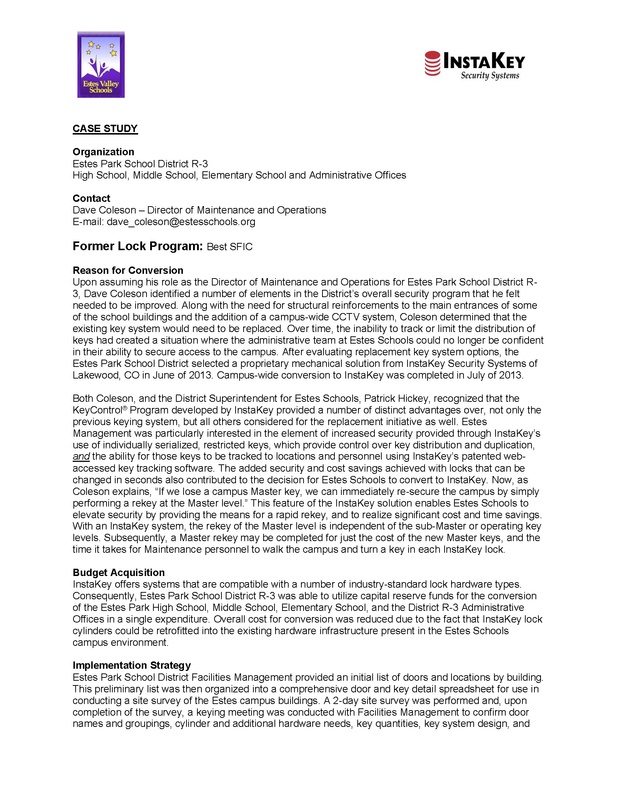 Both Coleson, and the District Superintendent for Estes Schools, Patrick Hickey, recognized that the Key Control Program developed by InstaKey provided a number of distinct advantages over, not only the previous keying system, but all others considered for the replacement initiative as well. Estes Management was particularly interested in the element of increased security provided through InstaKey’s use of individually serialized, restricted keys, which provide control over key distribution and duplication, and the ability for those keys to be tracked to locations and personnel using InstaKey’s patented web accessed key tracking software. The added security and cost savings achieved with locks that can be changed in seconds also contributed to the decision for Estes Schools to convert to InstaKey. Now, as Coleson explains, “If we lose a campus Master key, we can immediately re-secure the campus by simply performing a rekey at the Master level.” This feature of the InstaKey solution enables Estes Schools to elevate security by providing the means for a rapid rekey, and to realize significant cost and time savings. With an InstaKey system, the rekey of the Master level is independent of the sub-Master or operating key levels. Subsequently, a Master rekey may be completed for just the cost of the new Master keys, and the time it takes for Maintenance personnel to walk the campus and turn a key in each InstaKey lock.